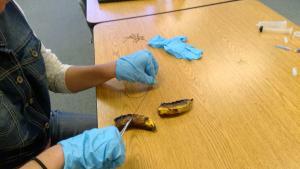 Nicole Sagner practices suturing a banana in her Veterinary Science Class taught by Mr. Lay. Suture refers to a seam consisting of several stitches. The vet science course includes anatomy and physiology of livestock and small animals, basic nutrition principles, principles of infectious diseases, diagnoses of diseases including signs and symptoms, clinical procedures, and principles of surgery in large and small animals. 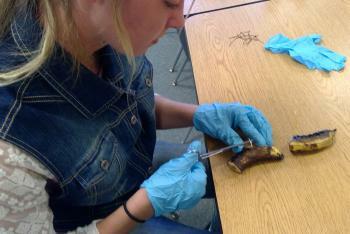 Students have the opportunity to give vaccinations and basic injections, become BQA (Beef Quality Assurance) certified, and basic suturing techniques.